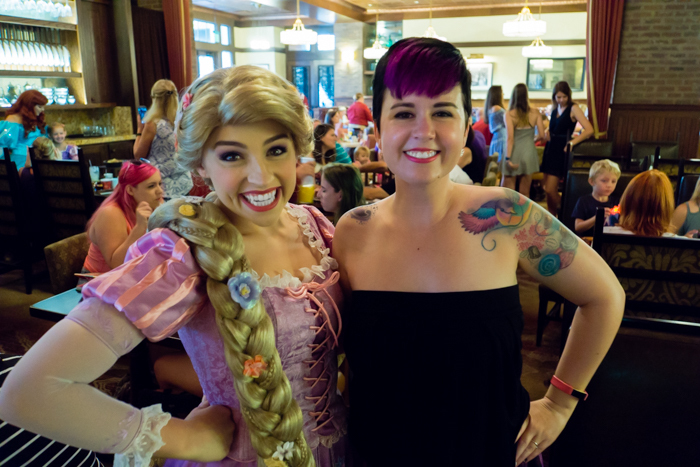 I’m a ridiculously huge fan of Rapunzel, so I knew as soon as this character meal was announced that I’d be doing my best to book it! In fact, since they started offering the Bon Voyage Adventure breakfast I’ve made two trips to Disney World. I’ve eaten there both times. There’s some serious swag for sale in the lobby of Trattoria al Forno during the Bon Voyage Adventure breakfast. 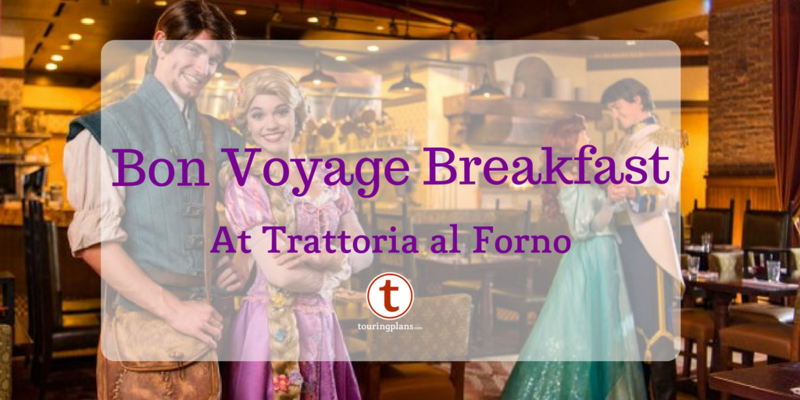 As soon as you walk into Trattoria al Forno (located at Disney’s BoardWalk ) in the morning, you’ll see that they’re set up for the Bon Voyage Adventure breakfast. 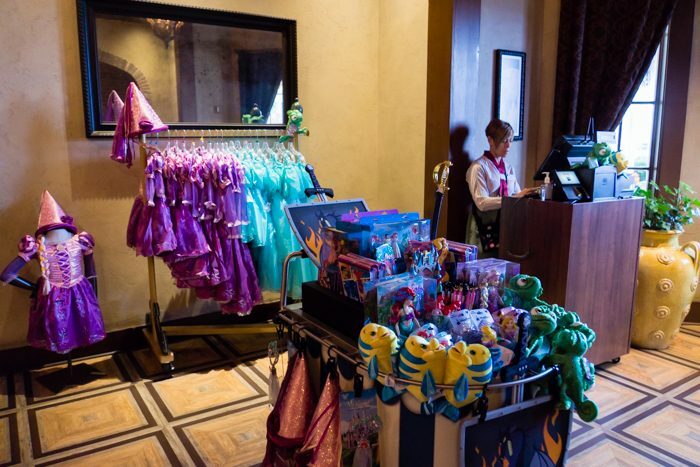 Namely, the cart of Rapunzel and Ariel swag gives it away. 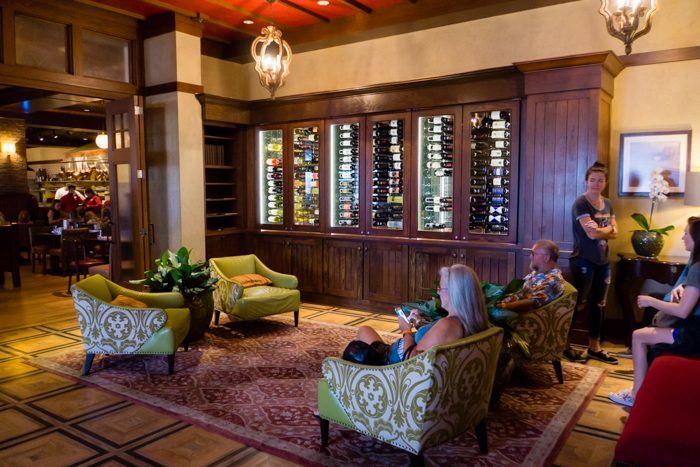 After you head to the counter and check in for your meal, you can take a seat and wait for your party to be called. Both times I’ve dined at this breakfast it’s only taken about five minutes from arrival to seating. I’ve never had a problem snagging a seat while waiting for my reservation. Your very own Bon Voyage Adventure journal! 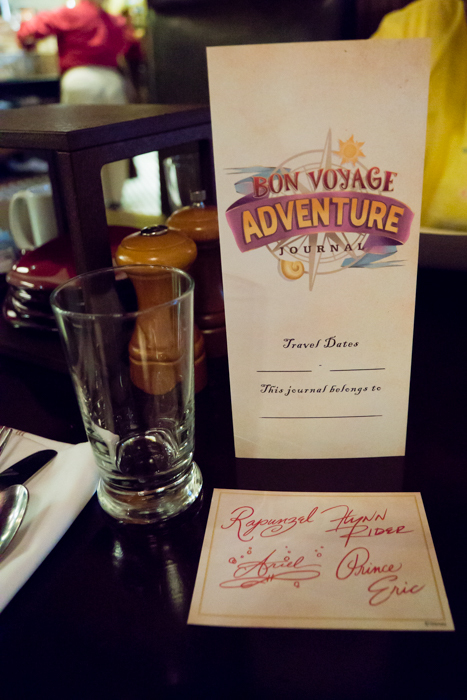 Once you’re seated, you’ll probably notice the Bon Voyage Adventure Journal on your table, along with an autograph card. (The characters will sign as well, but the autograph card is a nice touch.) The journal encourages you to “fill this journal with your adventures.” I’ve never partaken (it seems geared toward kids), but it is a nice memento. As you look around the dining area, you’ll see that it’s fairly wide open and you’ll most likely see the characters greeting tables. 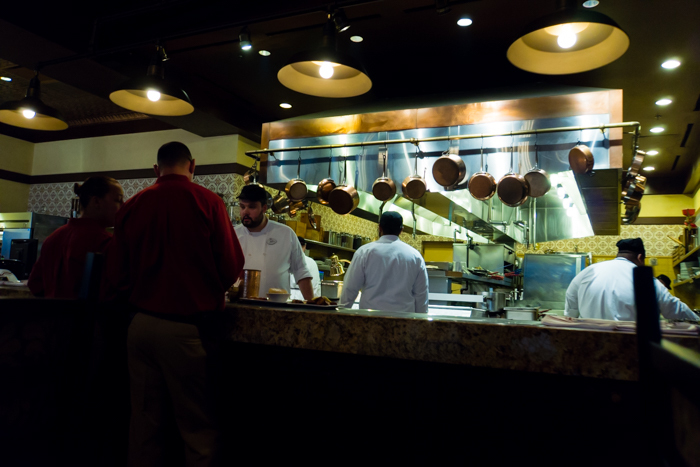 The nice thing about Trattoria al Forno is that I feel like the tables aren’t right on top of each other. I’ve dined at many a Disney restaurant where I feel like I’m sitting in the lap of the person at the next table, and that is not at all the impression here. We were definitely hungry as we waited for our food. Views like this did not help. Next, my guess is that you’ll have your eyes on that menu! The Bon Voyage Adventure breakfast comes with a variety of pastries for the table, and your server will likely bring those out before he or she takes your order. The pastries aren’t anything stand out, but I am a sucker for that Tangled sun pastry! Then each person will pick one starter (fruit salad or a berry, yogurt, and granola parfait) and one entrée. A non-alcoholic drink is also included, but if you want to try out any of their morning cocktails you will have to pay extra for those. The cost for this meal is $34 for adults and $20 for children. Click here for the full menu. For my meal I selected the fruit cup and Royale Breakfast, which included an oak-grilled steak, cheesy egg torte, asparagus, crispy onions, and roasted potatoes. Even though I was there mainly for the characters, I was extraordinarily pleased with my meal. (Well, the entrée. A fruit salad is just a fruit salad.) The steak was cooked to my specifications and was quite good, and those potatoes were crispy and delicious! The egg torte was also better than I expected. For my beverage I splurged and ordered the Peach Bellini. It was fruity and refreshing. King Triton’s Shipwreck al Forno, taken quickly. 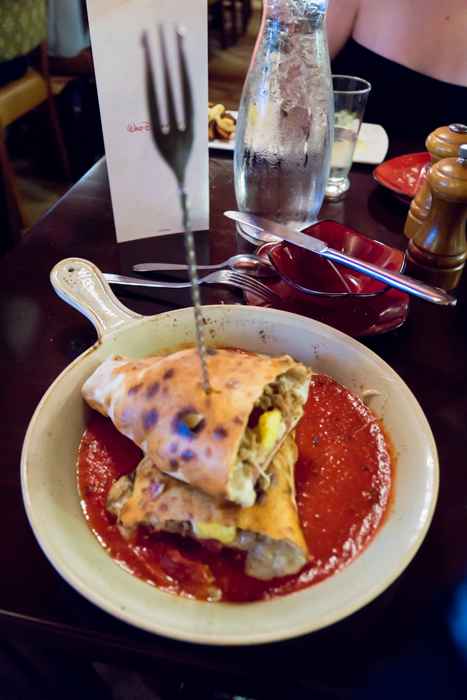 My husband’s meal consisted of the fruit salad and King Triton’s Shipwreck al Forno, which is a calzone with soppressata, bacon, sausage, cheese, and gravy. He raved about his meal. (I blinked and it was gone.) 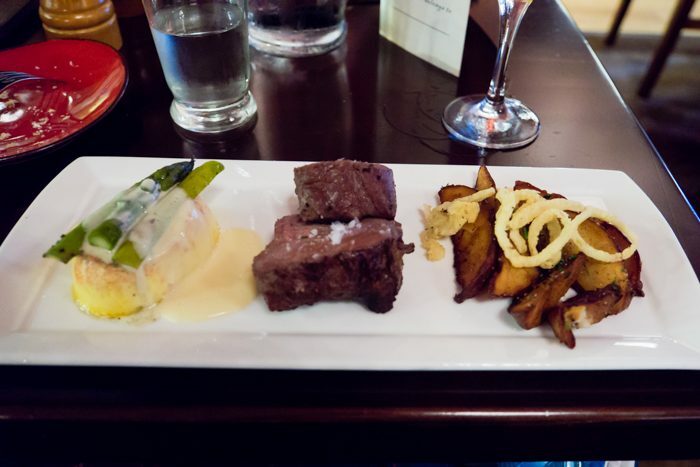 The one slightly odd thing about this dish is that it comes with King Triton’s trident in it, but the server has to take the trident out of the meal before walking away. I’m guessing that there was a problem with all of the tridents getting stolen or some epic trident battles, but it made for a weird interaction. Like, “Here is your food! But we don’t trust you with the cutlery.” In any case, it was made even weirder because I was then yelling, “Don’t take it yet!” and shoving the camera at my husband to take a photo of his meal. This was the second time while dining here that was the epitome of awkward. I hope you’re ready to be visited by royalty while you’re dining! Each of the characters comes around to the tables on their own. 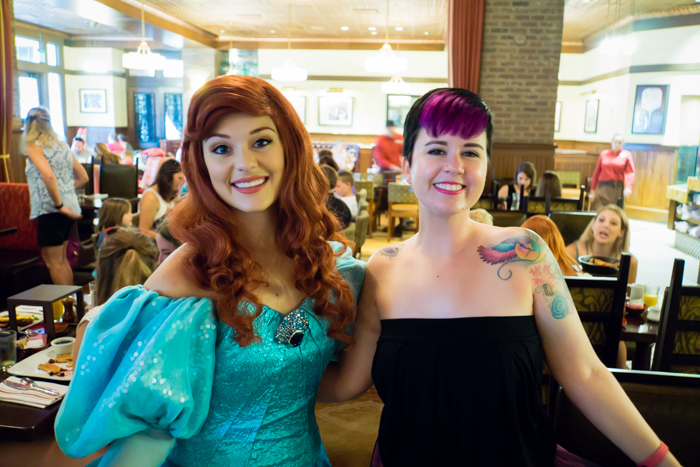 On both of my visits I’ve mostly had great interactions with the characters, although Ariel didn’t engage too much. The best way I can describe it is by saying that it is kind of like having a Toy Story Woody doll. You pull the string and he says a canned phrase. And then you do it again and you get another canned phrase. Perhaps she has an easier time interacting with kids. Or perhaps she’s just new to all this. I mean, she’s not exactly used to interacting with humans! Rapunzel was the main draw for me. And Flynn, of course. 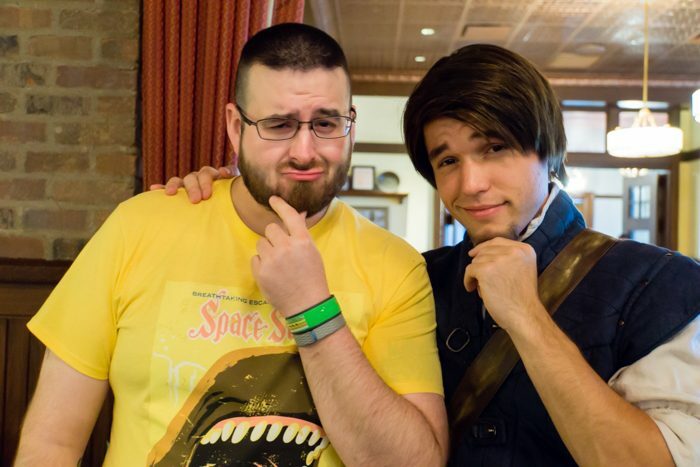 My husband matched him smolder for smolder. I think Ariel faces some challenges conversing with humans. And we can’t forget the ever-elusive Prince Eric! Overall, I think the Bon Voyage Adventure breakfast is a worthwhile meal. The food is good, you get to meet characters that are a little more difficult to find, and after your meal you can stroll right into Epcot! Have you dined here before? What did you think? Please share your thoughts in the comments! Wow. Glad your experience was better than ours. We are AP and DVC and go to Disney often. This is the only experience we have ever left before eating at in our lives. There were almost 100 people squeezed in to that waiting area when we’d got there on a Friday morning in September, we waited over 30 minutes for a table (and had a reservation), and then after sitting for 15 still hadn’t seen our server so got up and left. The kid menus weren’t themed to the experience but were guardians of the galaxy which I thought was odd. The manager apologized to my husband on our way out and gave him her card and asked him to email which we did and we didn’t even get a response from her. We did see each character announced while we were there and they were definitely fun but overall this was the least magical experience I have had in over 30 trips to Disney. Oh my gosh, that sounds crazy!! I would have been infuriated if I were you. Our most recent trip was on a Thursday in September (and previously a Wednesday in May), and it was pretty chill in there overall. I’m so sorry you had such a bad experience – what a bummer!! The worst service I’ve ever experienced at Disney World was at Sci Fi Dine-In. 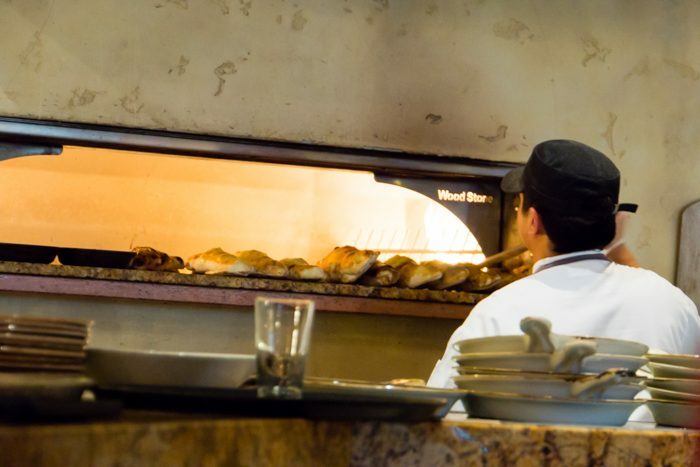 (Kind of like what you experienced at Trattori al Forno.) I know some people swear by Sci Fi, but I just can’t do it again. (And I gave them a try TWICE!) I hope you never have to go through anything again like what you went through at Trattoria! We had a bad experience around year ago at Sci-Fi as well. After arriving 10mins early for our ADR, we didn’t *start* eating until 2 hours later. So many tables continued to sit empty while hoards of people were waiting to be seated. I dunno what was going on… understaffed possibly? Thanks! The manager did finally write back and apologize for what she said was a lot of problems our morning so they are trying! We were there yesterday for breakfast & It was just okay. Our service was fine, but we didn’t get a journal or special card for the characters to sign. My frittata was very salty, but everyone else liked their food. Flynn was a no show. He was the character I wanted to meet the most, so I was really dissapointed. We weren’t told he wasn’t coming until over halfway through our meal, or I might not have stayed. Eliana of Avalor was the fill in and moved very quickly though the room like she had somewhere better to be. I can’t recommend the meal from our experience. We ate their last month and it was easily the most enjoyable character meal I’ve ever had. We had a 10:30 a.m. reservation the morning after MNSSHP. We loved being able to sleep in a little before taking an Uber over to the Boardwalk. The restaurant didn’t feel crowded or even all that loud (I HATE the noise level at Chef Mickey’s so this really impressed me). We loved the food. I had an Italian coffee with amaretto and it was perfect. We loved the pastries and even asked for extras of the Rapunzel star one. My entree was the polenta with housemade fennel sausage, poached eggs, mozzarella, and marinara. It sounds weird for breakfast, but it was so yummy. And we had wonderful character interactions. Flynn sat down in the empty chair next to my niece and talked to her for an especially long time. Eric was so impressed with my niece’s Ariel costume that he asked her to dance. We were seated at a table right by the door, so they had plenty of room to waltz around and twirl. Overall, I liked that my husband and I could have an alcoholic beverage and interesting adult food while sitting back and relaxing. We didn’t have to deal with taking my niece through a buffet or being worried about missing characters. And it wasn’t the standard Disney breakfast buffet food. 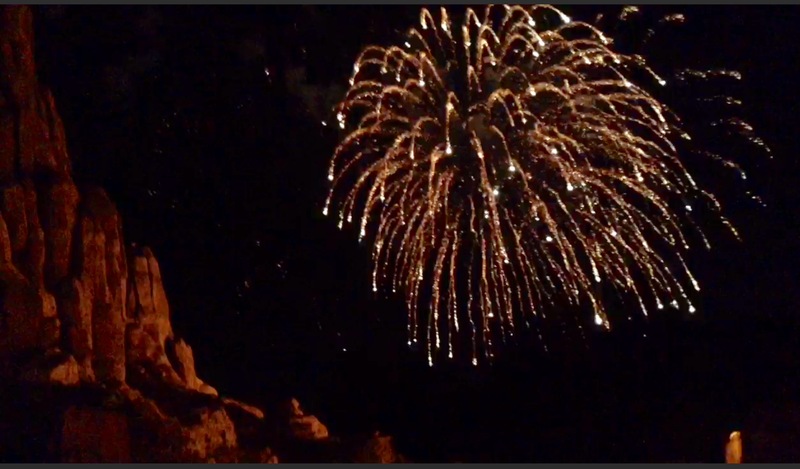 It felt more like an elevated “vacation” experience than any other meal we had on that trip. I am beyond excited to see this review! We leave for our next Disney trip in about 2 weeks, and the Bon Voyage breakfast will be a new experience for us. My boys are 7, 6, and 3, and they love the Disney princes. 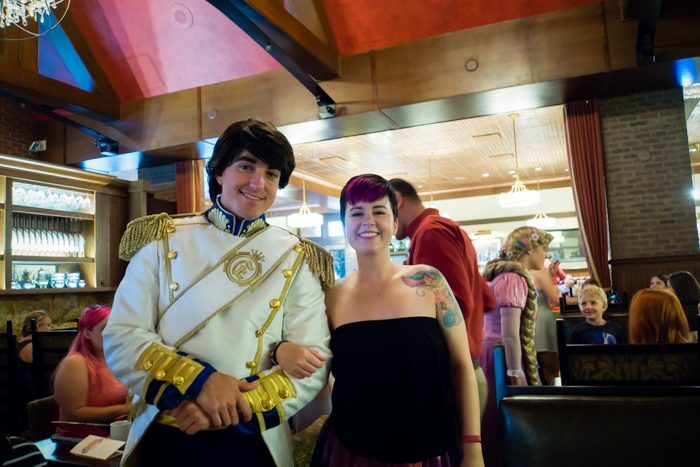 Previously, the only prince we could meet was Prince Charming (at 1900 Park Fare), but now we have two more that we can interact with!! One of my boys is dressing up as Flynn this year. 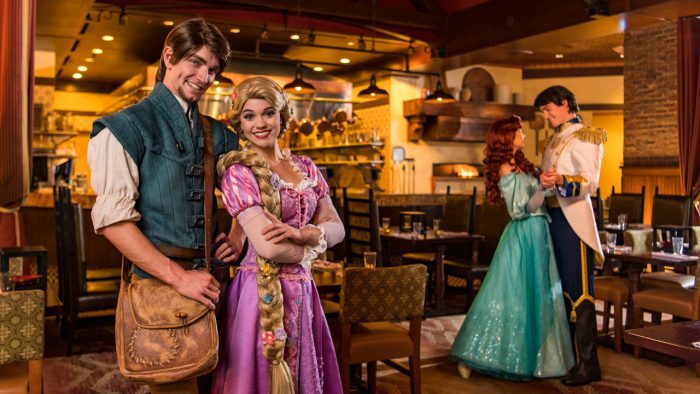 I am hoping to make some fun memories at this character dining experience!